This is an excellent novice run, only a little further away than the Klamath river from most California cities, and ultra pleasant. 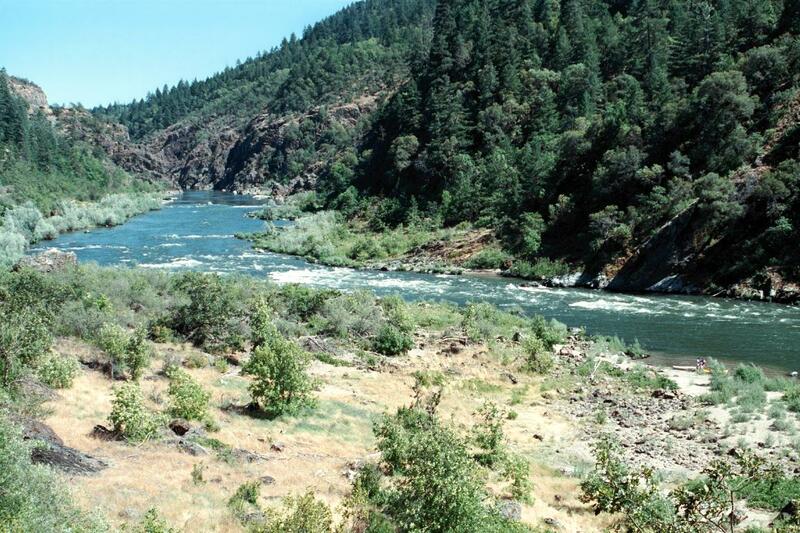 The rapids are more consistent than on any class II stretch of the Klamath. Rogue river water is clear and clean, full of fish, and deliciously warm, unlike most Sierra rivers. Fishing can be excellent and wildlife is abundant. On our trip, we saw an osprey dive into the water and emerge with a fish. 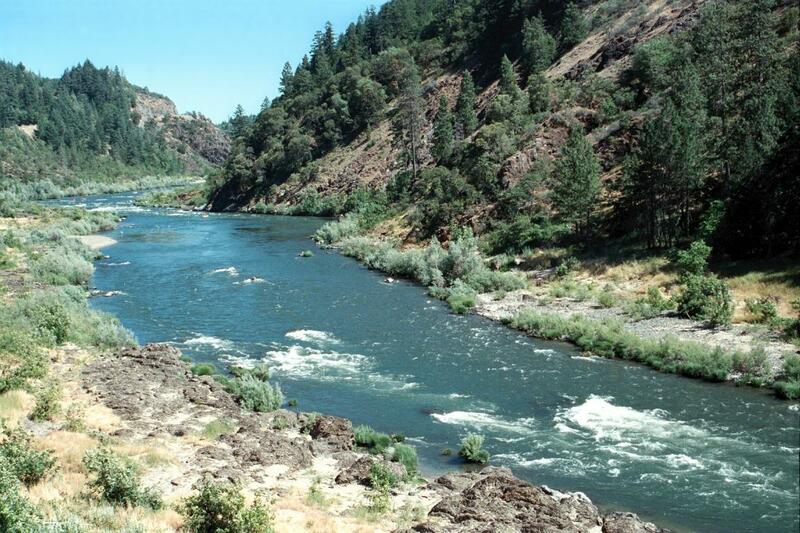 Until 1998 publication of Paddling Oregon by Robb Keller, this stretch was not included in any Oregon guidebook! Shuttles can be arranged in advance, or with minimal notice. Good maps of this run, and even a dedicated color guidebook, are available at Galice Resort and elsewhere. Shuttles are available there and from other companies nearby, such as Affordable Shuttles. Park your vehicle at the Hog Creek river access. Just downstream is a small gorge where a dam proposal was defeated when the Rogue River was granted wild & scenic status in 1964, the first river so designated. After the gorge, in sight of a highway bridge, is a long class II rapid. This is followed by a slow section. Before Indian Mary campground on the left, there are some nice semi-wilderness campsites on the right bank. After Indian Mary the pace of the river picks up, and you encounter several good class II rapids in succession. In the midst of busy whitewater you pass Galice Resort on the left bank. Further down, the length of slow sections increases, although interesting rapids continue past Almeda Bar to the Grave Creek wilderness run put-in, which is your take-out. Although all rapids are rated class II or lower, at higher flows some (avoidable) waves and holes are actually class III, being more than 1 meter in height or depth. Hog Creek Boat Ramp on river right, just above Hellgate canyon. Dunn Riffle, class II, starts in sight of, and continues after a break in the middle, almost to Hellgate bridge. Hellgate bridge, where the highway crosses from right to left bank. Mostly flatwater from here to Ennis Riffle. Indian Mary campground on river left; good primitive camping begins on the right as a dirt road on that side climbs above the river. Taylor Creek Gorge, followed by Taylor Creek on the left. Old Man Riffle, class II-. River access on left, just above Ennis Riffle, class II-. River splits around an island. Galice Chute Riffle, class II, way above the resort. Galice Store Riffle, class II, just above the resort. River access at the resort. Rocky Riffle, class II, below Galice resort. Almeda Bar river access and boat ramp. Sizemore Riffle, class II. Boat access on left bank. Grave Creek boat ramp on river right. 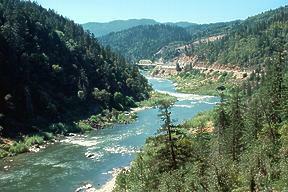 Downstream, the river becomes Wild & Scenic, and a USFS permit is required. If you are feeling brave, you could run class III Grave Creek rapid just below, and carry your boat back upstream to take-out. 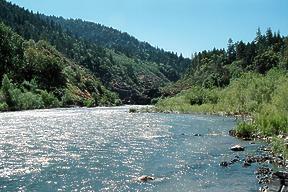 Riffle is a fishing term, applied to shallow rapids where fish are easily seen. Its application to whitewater is somewhat imprecise. Some of these riffles have an easy route down the center, while others have large holes that are difficult to see from above. These features can change at different flows, making class II ratings somewhat fluid.